This seemingly non-descript modification was one of the best I had seen. I think the person who did it probably thought it only provided a handrail to assist elderly and frail people up and down the entry steps of the Rialta. However, after I thought about it for a while, it occurred to me that it also solves one of the most annoying things about the Rialta: the projecting latch pin for the door lock and it tendency to rip apart shirts and pants of those unknowingly allowing their body to get close to that side of the entryway. The addition of the handrail along the way of the Model HD provides a buffer or barrier and helps keep garments and clothing articles from catching on the projecting door latch. This one gets the Baldy Top Award For Excellence! Please note that this can only be done on the Model HD with the refrigerator wall right next to the entry. In addition, at least one of the brackets will require additional wood backing in order to get a strong support. This will require removing the refrigerator in order to install the additional backing for the bracket as noted in the message below. 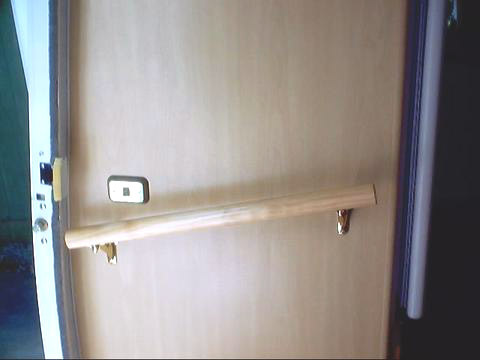 At the request of the senior citizen who rides along with me in our HD Rialta, I have added a handrail at the coach entry door, mounted on the side of the refrigerator cabinet. I used standard handrail brackets (solid brass @ $9.99, 2 each) and stock wood handrail stock ($1.85/ ft; I bought 4' but used just slightly over 2') from Home Depot. I had to reinforce the side panel of the refrigerator cabinet because there is no backing behind the paneling in the front corner. This necessitated completely removing the fridge from the cabinet. I then glued in a piece of 1" x 6" vertically from the bottom of the cabinet to the upper corner. This provided sufficient backing for the "inner" bracket. The area where I mounted the "outer" bracket already had enough thickness of wood in place. 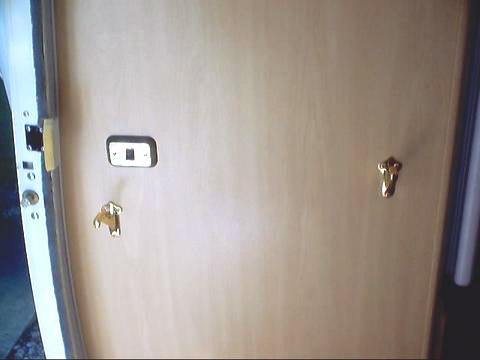 After replacing the refrigerator, I installed the mounting brackets. I cut the handrail to length and secured it in place. I then removed it to apply four coats of water based polyurethane varnish, sanding well between coats. The water-based poly was quick drying (30 minutes between coats) and the whole process took less than a day. I also rubbed the railing down with automotive polishing compound (less aggressive than rubbing compound) and applied a coat of wax, buffing well. I reinstalled the railing to complete the job. The handrail is quite sturdy and looks good as well. It will make entering and exiting the coach easier.